I continue to be pleased at how the skills of the staff at the hearing clinic are progressing. We had some occupational health staff from a factory come for training and it made me so happy to watch Blessings teaching them things that I remember teaching him. We have also been working with the main clinic to try to ensure standardized treatment of ear infections. This isn’t something I would have much to do with as an audiologist in the UK, but here we are expected to identify them and recommend appropriate treatment to the clinical officers. Blessings and I gave a presentation to the doctors, nurses and clinical officers, it seems we’ve both learned a great deal about the many different types of ear infection that are so prevalent here. It’s not uncommon to see chronic suppurative otitis media that has advanced to the stage where the patient has no eardrum left, particularly in patients with HIV; fungal infections are also common and can take a long time to treat effectively. I sat back and waited last week, as one of the staff carried out an ABR by himself, testing an adult with suspected ANSD. I just asked him to come and show me the results when he was done. I well remember the moment when I was left for the first time with a patient to manage an ABR by myself, and I wanted Kamuzu to experience this too, with the knowledge that I wasn’t far away if he needed me. He made some mistakes, but got the results required, and it was an excellent learning experience. Usually we’re seeing babies or difficult-to-test children, and for this we still work together. 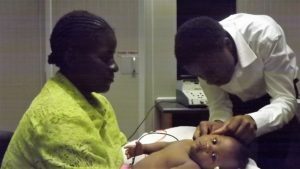 Due to the newborn hearing screening programme, we’re now doing at least one ABR a week, which is excellent practice. The first baby with a hearing loss to come through the newborn screening was identified last week. Outreach news – we hope we have set up a regular clinic now at Kasungu, which is a couple of hour’s drive north of where we are in the capital Lilongwe. We were invited by the hospital there to visit for 2 days; they provided us with food and accommodation, 3 rooms to work in (one with electricity! ), and a space for our audiotrailer. Of course, no outreach is complete without the inevitable vehicle problems. We had almost reached our destination when the wheel came off the audiotrailer. Fortunately Gospel is an excellent driver and stopped the landrover safely; it was daylight on a safe stretch of flat road, a very good place for a breakdown. The staff knew what to do – this has happened before – so I stood and watched as they efficiently jacked up the trailer and prepared for the repair. We knew that if I went with the landrover into Kasungu to look for a mechanic, the price would immediately go up (the white person effect), so I remained with Kamuzu, ‘guarding’ the trailer. Sitting in the gentle sunshine, eating crisps, chatting and watching the world go by, it really was quite a relaxing experience! At one point we could hear the drumbeat of the Gule Wamkulu (a secret and occasionally threatening cult) and Kamuzu explained that if they came our way then we should probably move, but they remained just within earshot and all was fine. The outreach was really excellent, the staff were so welcoming and accommodating; on the second day a large number of staff arrived, brought by the hospital administrator for ‘orientation’ so that they could see what we were doing. Gospel did a wonderful impromptu tour of our set-up with them. A number of the hospital staff came to us for treatment, or brought their relatives, and it was good to be able to demonstrate to them the value of our services. The accommodation they provided us with was a guesthouse in the grounds of Kamuzu Academy. I guess this school is the Eton of Malawi; going through the gates was like entering another world. We were given breakfast in the school refectory, and entering it was like walking into the dining hall of a Cambridge college – the same arches, parquet flooring, long wooden tables, high table, everything. Well, almost everything. Kamuzu was the life-president of Malawi about 20 years ago, he was from Kasungu and it appears that this academy, which was his pride and joy, has gone to seed slightly since he died. The tables may have been excellent quality, but the chairs were the regular plastic garden chairs you find everywhere, and the tablecloth we had at the high table was a bedsheet that had been cut in half and sewn together, sides-to-middle. I am pretty good at eating everything that comes my way, but the excessively sweetened rice porridge was just too much for me, something I regretted 8 hours later when we were still working and hadn’t had time for lunch! Yes, the outreach was busy, which is how we like it, we think that the team of 4 of us saw over 120 patients in the approximate 18 working hours of our 2-day outreach. Coming up over the next few weeks: we have a group of American students visiting for 2 weeks to do outreach work and some teaching. I’ll be going with them to supervise a 4-day outreach in Mzuzu. Once they’re gone we will be returning to Kasungu, and we’re also planning a one-day outreach to Dzaleka refugee camp. Dzaleka is long-term home to thousands of people; the clinic used to visit quite regularly, but we haven’t been for some time. We were contacted to ask if we could do some work in the camp, and so Blessings did a day of hearing screening there. 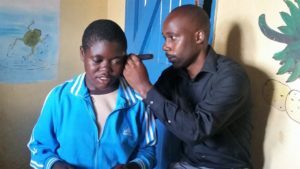 From this he identified many people who need complex testing at the clinic, including a family of 9 children who all have hearing and visual impairment. Because of the challenges of transport, all 9 children (plus interpreter) will come to the clinic at the same time – that’s going to be an interesting day!